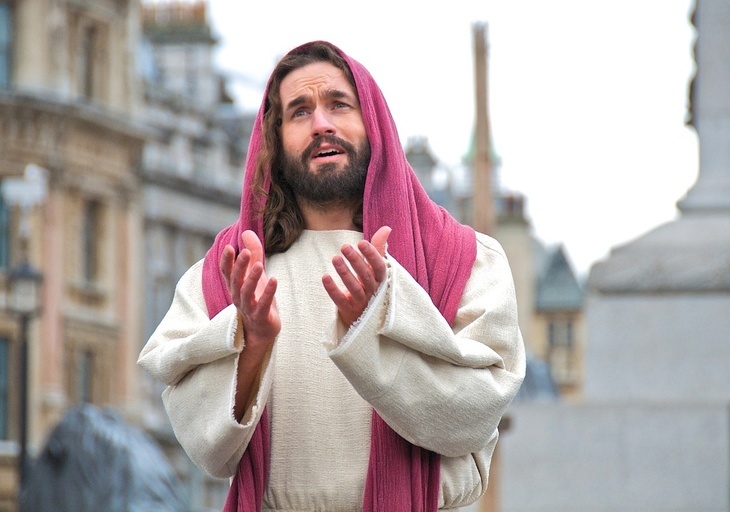 For over two decades, James Burke-Dunsmore has played Jesus on Good Friday — in an epic telling of the messiah's story, played out in Trafalgar Square. Londonist talks to the actor about shaving, getting recognised out and about... and bread-thieving temple guards. You've been doing this for 22 years — what's changed? What have you learned? Many things, not least: always double-check you're wearing a loincloth. 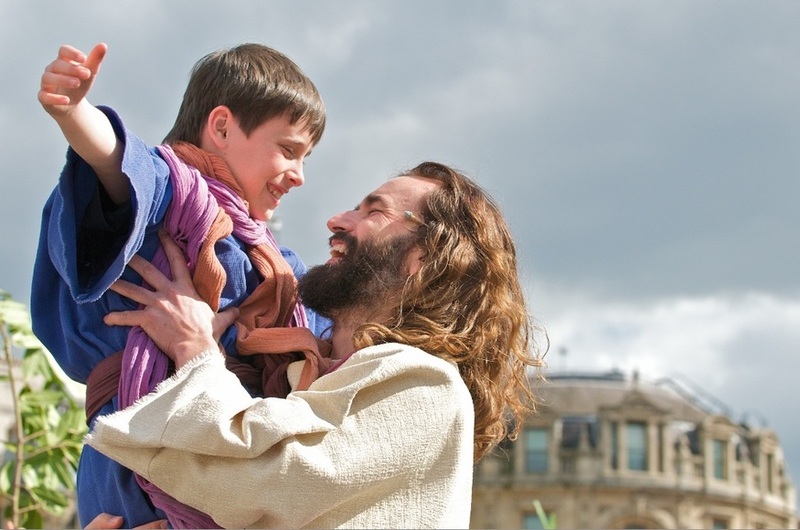 22 years portraying Jesus may seem odd, but a focussed repertoire offers all sorts of opportunity for deeper understanding and enjoyment, a rare thing at a time when we might think it advantageous to constantly diversify. Gielgud played Hamlet for over 15 years and many thought his portrayal grew stronger right to the end. I hope I can achieve the same. Do you keep the beard and hair all the time? Yes. It saves a fortune in razors. Have you ever taken public transport in the full costume? I never wear it unless I am portraying Jesus. Have you had any mishaps while playing Jesus? A temple guard stole the last supper bread to pad his helmet, my donkey bolted with me on him, Judas was absent from the last supper, a Roman soldier fractured my ankles while crucifying me, the narrator skipped a whole scene… the list goes on. And does one of the actors always end up in the fountain? Not always, you'll have to wait and see. Is it challenging putting on a show in the middle of London? Busses and sirens may pepper the performance, but we are not in a darkened theatre. I can see the 20,000 faces and this offers a great opportunity to keep the connection tight. If a plane roars overhead during the last words on the cross, I wait, the audience waits, the atmosphere is held, and then when we are all ready, we carry on. A drunken man got extremely emotional at the sight of me carrying the cross, following me and crying out for my release all the way to the crucifixion. You must get recognised everywhere - what's the strangest place you've been called out as Jesus? While studying elephant behaviour in Africa I was approached by two heavily armed rangers. I readied myself to be interrogated, maybe bribed, but they had seen my UK portrayal online and had come to shake my hand. If Jesus had been a Londoner, where would he have lived? 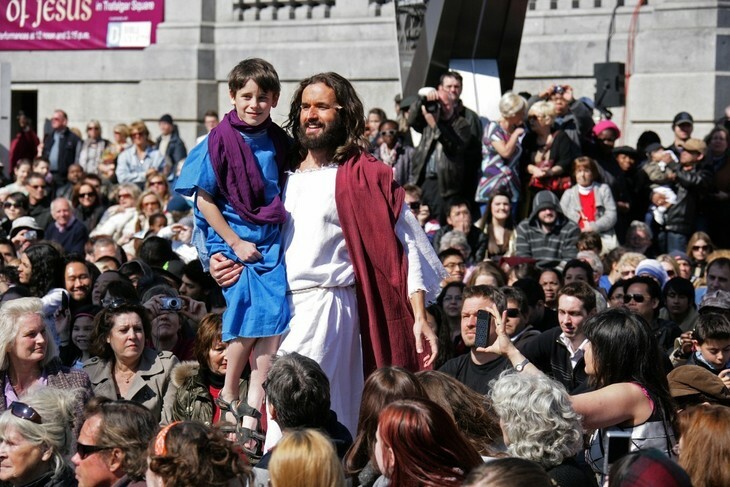 See James in action, alongside a biblical-size cast, in Trafalgar Square, on Good Friday (19 April). There are two shows — one at noon, and one at 3.15pm. Both are free to attend, and you don't need to book.